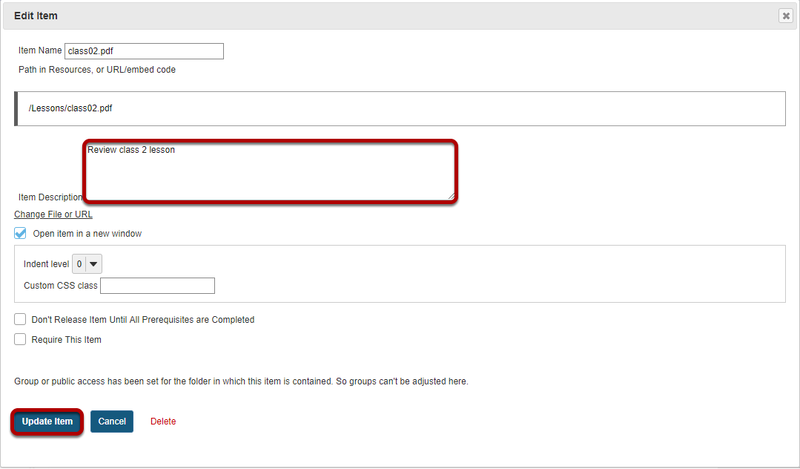 Sakai Community DocumentationSakai 19 User Guide (English) LessonsHow do I add a file from Resources to a Lessons page? 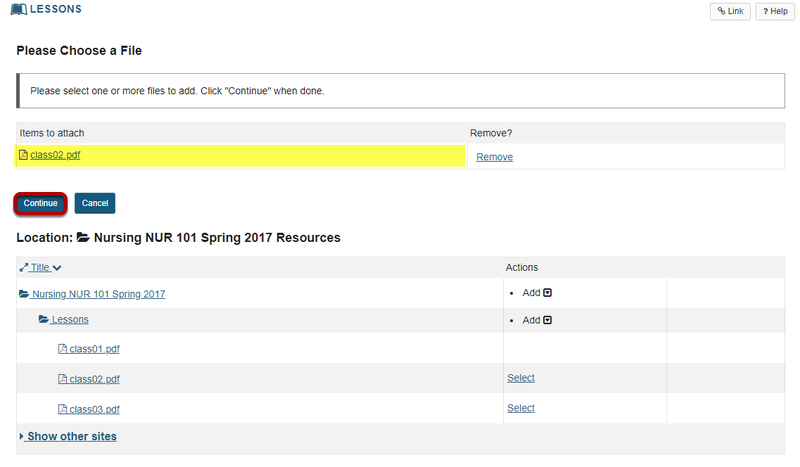 Instructors can upload files or link to existing Resources on a Lessons page. Click Add Content, then Add Content Links. Zoom: Click Add Content, then Add Content Link. 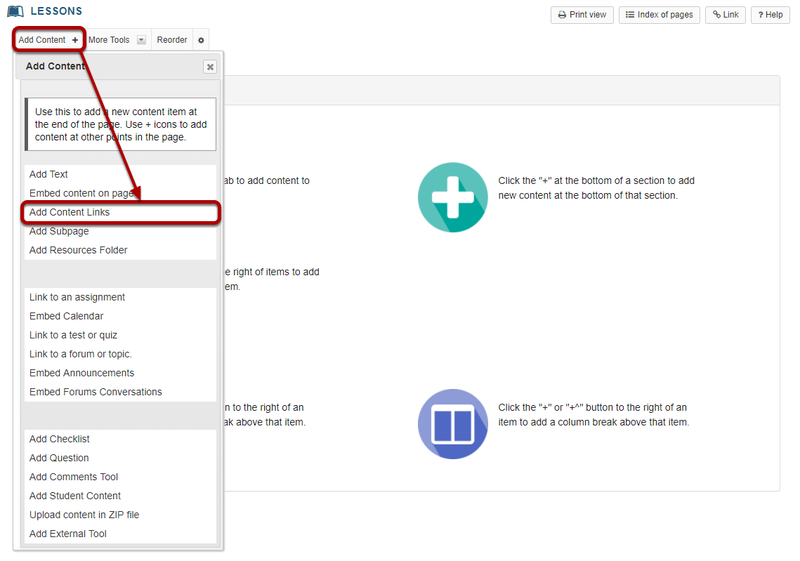 From the Add Content drop-down menu, select Add Content Links. Locate and select the file to upload, then click Open. View file link on page. Zoom: View file link on page. 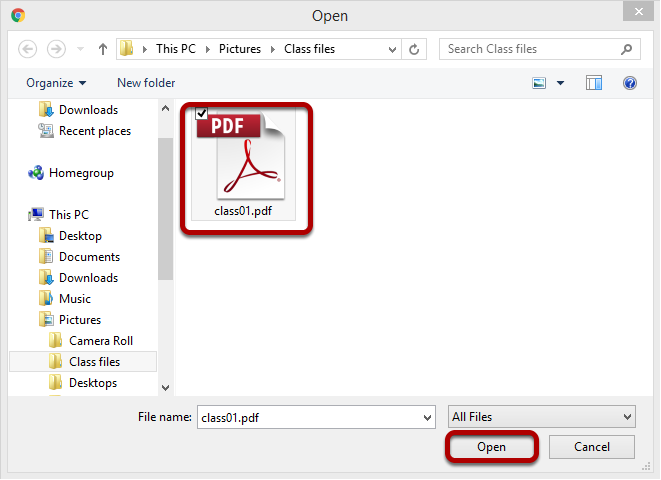 This returns the display to the Lessons Page with a link to the uploaded file. Add a description, then click Update Item. Zoom: Add a description, then click Update Item. Updating returns the display to the Lessons page with a link to the uploaded file and a description. Notice item location in Resources. Zoom: Notice item location in Resources. 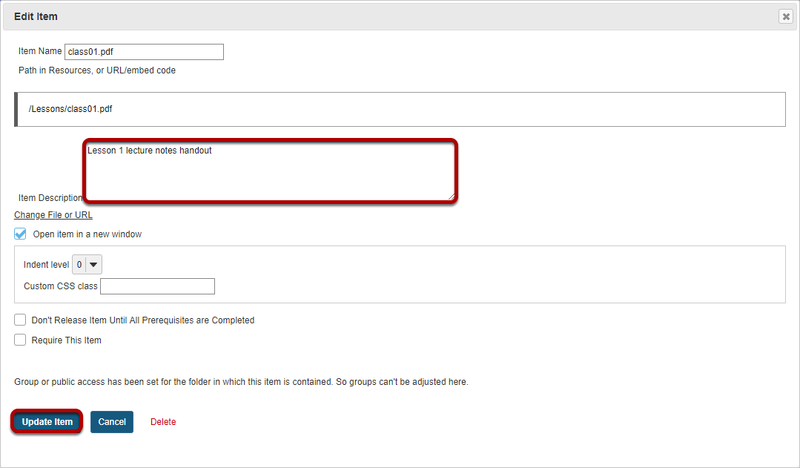 Notice that the uploaded file has been placed in the Lessons page folder in Resources. Zoom: Click Add Content, then Add Content Links. Click the Or select an existing files from Resources link to choose from your Resources. Locate the file, then click Select. Zoom: Locate the file, then click Select. Locate the file in Resources that you want to link to, then click the Select link (to the right of the file) to choose that file. The file you have selected will appear listed at the top of the screen. If this is the correct file, click Continue. Zoom: View item on page. This returns the display to the Lessons Page with a link to the file and a description. Prev: How do I add a website link to a Lessons page? Next: How do I add assignments to a Lessons page?